What a great way to transition from the year of the leafy greens to the year of the root vegetable but to start the year off with a twofer vegetable like beets. When growing beets, you get tasty greens which are a good source of calcium and vitamin A and a tasty root which can be used fresh or stored. Beets are a crop which can be sown and grown throughout the entire gardening season, since the seeds germinate in soil temperatures from 45 to 85 degrees F. The “seed” is really a fruit which usually contains multiple seeds and, thus, beets will need to be thinned with the thinnings being used as micro greens in a salad. Cultural requirements for beets can be found on the GIEI website under “Vegetable Profiles” or http://www.growit.umd.edu/Vegetable%20Profiles/Beets.cfm. In my garden, I grow mostly globe shaped beets which are tend to be quick maturing. My favorites are “Red Ace”, “Detroit Dark Red” and “Touchstone Gold” which is a sweet yellow beet. The red varieties mature in 48 to 50 days, while Touchstone Gold matures in 55 days. I love the Touchstone Gold for its better germination than “Golden”, color and less earthy flavor. One of my favorite spring salads is made by roasting a few of each of these beets, cooling them, dicing them into bite size pieces, adding a little feta cheese and a sprinkling of good balsamic vinegar. I generally roast all of my beets since it tends to concentrate the flavors and make them sweeter. My garden consists of four foot wide raised beds. In general, I plant a block of beets about four feet by four feet. Seed is planted about two inches apart in four rows (along my drip irrigation tape) and thinned to about three to four inches (a total about 64 beets in the four foot square). I succession plant my beets every three to four weeks through the entire year, planting my last crop sometime in late August or the first week of September. 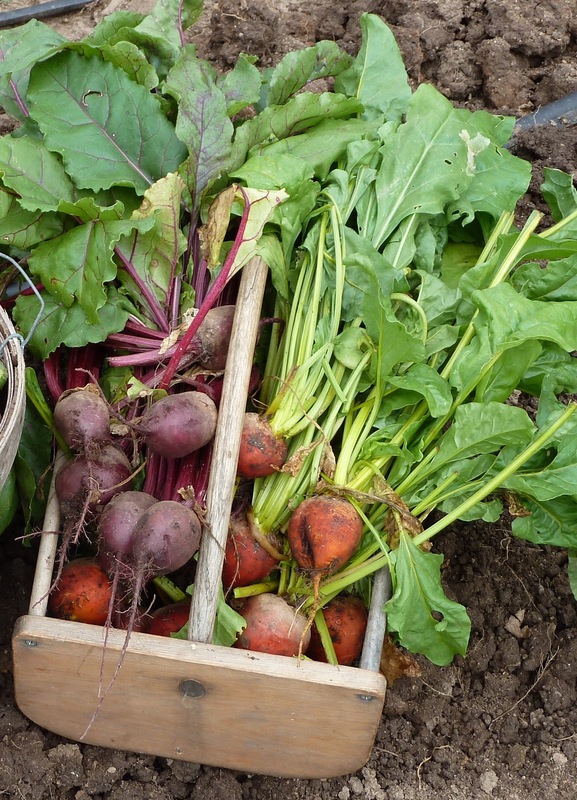 With a days to maturity of 55 days and addition of the short day factor of 14 days, these beets can be dug early to mid-November, although they may have to be protected using season extension techniques such a row cover, cloche or cold frame. So if you don’t currently grow beets, try some in 2013, especially the Touchstone Gold variety if you are looking for a less earthy flavor. Does anyone have recipes for this great vegetable? Thank you. I do! I roast the beets and slice. Then serve them up with caramelized pecans, blue cheese crumbles and a walnut oil/dijon vinaigrette. Amazing combo! This salad (enjoyed at the Blue Heron restaurant in York, PA) was the reason I started growing beets! It's really that good!